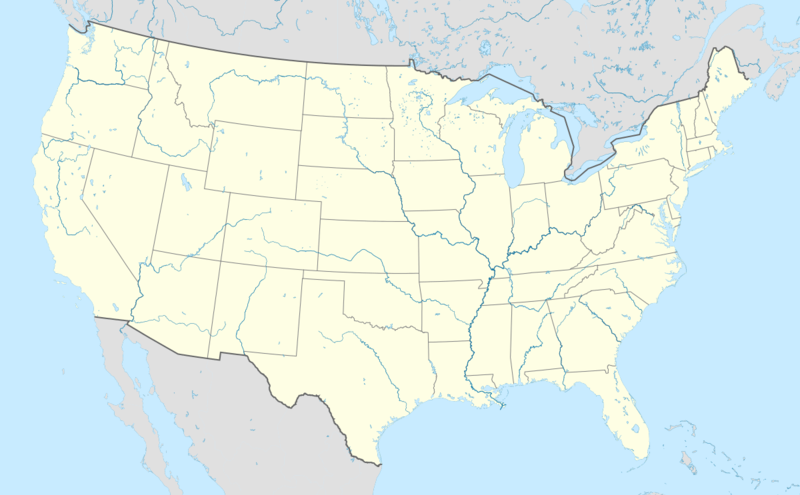 Columbus is a city in the U.S. state of Georgia and the county seat of Muscogee County, with which it is consolidated. According to the 2013 estimates from the U.S. Census Bureau, Columbus has a population of 202,824 residents, with 316,554 in the greater Columbus-Phenix City metropolitan area. The metro area joins the nearby Alabama cities of Auburn and Opelika to form the Columbus-Auburn-Opelika Combined Statistical Area, which has an estimated population of 501,649. Columbus is directly to the east across the Chattahoochee River from Phenix City, Alabama. Situated at the heart of the Chattahoochee Valley, Columbus is Georgia's second-largest city and fourth-largest metropolitan area. Columbus lies 100 miles (160 km) southwest of Atlanta. Fort Benning, home of the United States Army Infantry School and a major employer, is located south of the city in Chattahoochee County. Columbus is home to museums and tourism sites, including the National Infantry Museum, dedicated to the United States Army's Infantry Branch. It has the longest urban whitewater rafting course in the world constructed on the Chattahoochee River. This was for centuries and more the traditional territory of the Creek Indians, who became known as one of the Five Civilized Tribes of the Southeast after European contact. Those who lived closest to white-occupied areas conducted considerable trading and adopted some European-American ways. Founded in 1828 by an act of the Georgia Legislature, Columbus was situated at the beginning of the navigable portion of the Chattahoochee River and on the last stretch of the Federal Road before entering Alabama. The city was named for Christopher Columbus, its founders likely influenced by the writings of Washington Irving. The plan for the city was drawn up by Dr. Edwin L. DeGraffenried, who placed the town on a bluff overlooking the river. Across the river to the west, where Phenix City, Alabama is now located, Creek Indians still lived until they were forcibly removed in 1836 by the federal government to make way for European-American settlers. The river served as Columbus's connection to the world, particularly enabling it to ship its commodity cotton crops from the plantations to the international cotton market via New Orleans and ultimately Liverpool, England. The city's commercial importance increased in the 1850s with the arrival of the railroad. In addition, textile mills were developed along the river, bringing industry to an area reliant upon agriculture. By 1860, the city was one of the more important industrial centers of the South, earning it the nickname "the Lowell of the South," referring to an important textile mill town in Massachusetts. When the Civil War broke out in 1861, the industries of Columbus expanded their production; this became one of the most important centers of industry in the Confederacy. During the war, Columbus ranked second to Richmond in the manufacture of supplies for the Confederate army. In addition to textiles, the city had an ironworks, a sword factory, and a shipyard for the Confederate Navy. 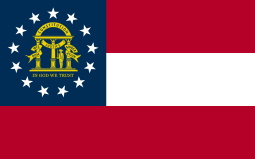 Unaware of Lee's surrender to Grant and the assassination of Abraham Lincoln, Union and Confederates clashed in the Battle of Columbus, Georgia, on Easter Sunday, April 16, 1865, when a Union detachment under General James H. Wilson attacked the city and burned many of the industrial buildings. John Stith Pemberton, who later developed Coca-Cola, in Columbus, Georgia, was wounded in this battle. After becoming addicted to morphine, Pemberton sought out a replacement for his addiction. After Creating Coca Cola, he carried it to Atlanta before he died in 1888. Col. Charles Augustus Lafayette Lamar, owner of the last slave ship in America, was also killed here. A historic marker has been erected in Columbus. It notes that this was the site of the "Last Land Battle in the War from 1861 to 1865." Reconstruction began almost immediately and prosperity followed. Factories such as the Eagle and Phenix Mills were revived and the industrialization of the town led to rapid growth; the city outgrew its original plan. The Springer Opera House was built on 10th Street, attracting such notables as British writer Oscar Wilde. The Springer is now the official State Theater of Georgia. By the time of the Spanish–American War, the city's modernization included the addition of trolleys extending to outlying neighborhoods such as Rose Hill and Lakebottom, and a new water works. Mayor Lucius Chappell also brought a training camp for soldiers to the area. This training camp named Camp Benning would grow into present-day Fort Benning, named for General Henry L. Benning, a native of the city. In the spring of 1866 the Ladies Memorial Association of Columbus passed a resolution to set aside one day annually to memorialize the Confederate dead. The secretary of the association, Mrs. Charles J. (Mary Ann) Williams, was directed to write a letter inviting the ladies of every Southern state to join them in the observance. The letter was written in March 1866 and sent to representatives of all of the principal cities in the South, including Atlanta, Macon, Montgomery, Memphis, Richmond, St. Louis, Alexandria, Columbia, and New Orleans. This was the beginning of the influential work by ladies' organizations to honor the war dead. The date for the holiday was selected by Elizabeth "Lizzie" Rutherford Ellis. She chose April 26, the first anniversary of Confederate General Johnston's final surrender to Union General Sherman at Bennett Place, North Carolina. For many in the South, that act marked the official end of the Civil War. In 1868, General John A. Logan, commander in chief of the Union Civil War Veterans Fraternity called the Grand Army of the Republic (GAR), launched the Memorial Day holiday that has become observed in the entire United States. General Logan's wife said he had borrowed from practices of Confederate Memorial Day. She wrote that Logan "said it was not too late for the Union men of the nation to follow the example of the people of the South in perpetuating the memory of their friends who had died for the cause they thought just and right." 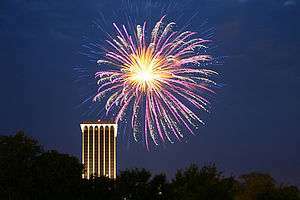 With the expansion of the city, leaders who promoted establishing a university, founded Columbus College, a two-year institution which later was developed as Columbus State University, now a comprehensive center of higher learning. 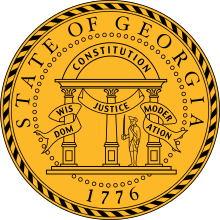 The city government became consolidated with the county in 1971, the first of its kind in Georgia (and one of only 16 in the U.S. at the time). Expanding on its industrial base of textile mills, the city has been the home of the headquarters for Aflac, Synovus, TSYS and Carmike Cinemas. The Muscogee County Courthouse in 1941, which was demolished in 1970. During the 1960s, 1970s and 1980s, the subsidized construction of highways and suburbs resulted in drawing off the middle and upper classes, with urban blight, white flight, and prostitution in much of downtown Columbus and adjacent neighborhoods. Early efforts to halt the gradual deterioration of downtown began with the saving and restoration of the Springer Opera House in 1965. It was designated as the State Theatre of Georgia, helping spark a historic preservation movement in the city. This has documented and preserved various historic districts in and around downtown. Through the late 1960s and early 1970s, large residential neighborhoods were built to accommodate the soldiers coming back from the Vietnam War and for those associated with Ft. Benning. These range from Wesley woods to Leesburg to Brittney and Willowbrook and the high end Sears woods and Windsor park. Large tracts of blighted areas were cleaned up. 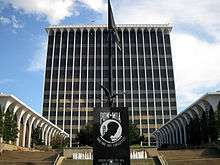 A modern Columbus Consolidated Government Center was constructed in the city center. A significant period of urban renewal and revitalization followed in the mid to late 1990s. With these improvements, residents and businesses have been attracted to formerly blighted areas. Municipal projects have included construction of a softball complex, which hosted the 1996 Olympic softball competition; construction of the Chattahoochee RiverWalk; construction of the National Civil War Naval Museum at Port Columbus, construction of the Coca-Cola Space Science Center, the expansion of the Columbus Museum, and road improvements to include a new downtown bridge crossing the Chattahoochee River to Phenix City. During the late 1990s, commercial activity expanded north of downtown along the I-185 corridor. During the 2000s, expansion and historic preservation continued throughout the city. South Commons has been revitalized. This area combines the 1996 Olympic softball competition complex, A. J. McClung Memorial Stadium, Golden Park, the Columbus Civic Center, and the recently added Jonathan Hatcher Skateboard Park. The National Infantry Museum has been constructed in South Columbus, located outside the Fort Benning main gate. Columbus has a center for the fine and performing arts. RiverCenter for the Performing Arts, which opened in 2002, houses Columbus State University's music department. In 2002 Columbus State's art and drama departments moved to downtown locations. Such initiatives have provided Columbus with a cultural niche and with vibrant and modern architecture mixed among older brick facades. The "Ready to Raft 2012" campaign is a project that created an estimated 700 new jobs and is projected to bring in $42 million annually to the Columbus area. The project resulted in the longest urban whitewater rafting venue in the world. This, in addition to other outdoor and non-outdoor tourist attractions, led to around 1.8 million visitors coming to Columbus during the fiscal year 2015, according to the Columbus Convention and Visitors Bureau. In upcoming years, the city predicts that an additional 30,000 soldiers will be trained annually at Fort Benning due to base realignment and closure of other facilities. As a result of this, Columbus is expected to see a major population increase. Columbus is one of Georgia's three Fall Line Cities, along with Augusta and Macon. The fall line is where the hilly lands of the Piedmont plateau meet the flat terrain of the coastal plain. As such, Columbus has a varied landscape of rolling hills on the north side and flat plains on the south. The fall line causes rivers in the area to decline rapidly towards sea level. 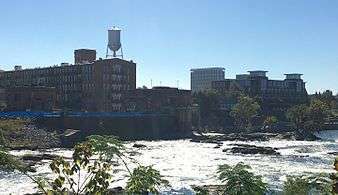 Textile mills were established here in the 19th and early 20th centuries to take advantage of the water power from the falls. Columbus was developed along the Chattahoochee River. Interstate 185 runs east of the city, with access from exits 1, 3, 4, 6, 7, 8, 10, 12, and 14 to the city. Interstate 185 runs north 96 mi (154 km) to Atlanta, and 169 miles northwest of Tallahassee, Florida. U.S. Route 27, U.S. Route 280, and Georgia State Route 520 (known as South Georgia Parkway) all meet in the interior of the city. U.S. Route 80 runs north of the city, locally known as J.R. Allen Parkway; Alternate U.S. Route 27 and Georgia State Route 85 run northeast from the city, locally known as Bill Heard Expressway. 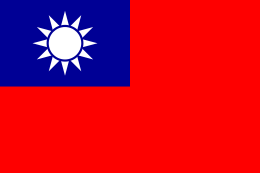 The city is located at 32°29′23″N 84°56′26″W﻿ / ﻿32.489608°N 84.940422°W﻿ / 32.489608; -84.940422. According to the US Census Bureau, the city has a total area of 221.0 square miles (572 km2), of which, 216.3 square miles (560 km2) of it is land and 4.7 square miles (12 km2) of it (2.14%) is water. Columbus has a humid subtropical climate according to the Köppen climate classification system. Daytime summer temperatures often reaches a high in the mid 90s, and low temperatures in the winter average in the upper 30s. 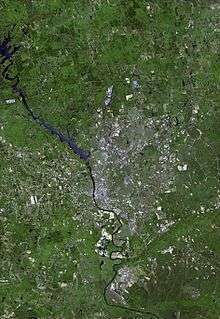 Columbus is often considered a dividing line or "natural snowline" of the southeastern United States with areas north of the city receiving snowfall annually, with areas to the south typically not receiving snowfall every year or at all. Columbus is within USDA hardiness zone 8b in the city center and zone 8a in the suburbs. One of Columbus' nicknames: "The Fountain City." Downtown, also sometimes called "Uptown" (though "Uptown" is actually the title given to both a non-profit organization operating to encourage area growth and development or "urban renewal" in the city and also to the actual physical area of that development itself, which is an expanding subsection of the Downtown district located in the areas from Broadway to the Chattahoochee River) is the city's central business district, and home to multiple historic districts, homes, and churches, such as the Columbus Historic Riverfront Industrial District, the Mott House, and the Church of the Holy Family. East Columbus is a predominantly residential area located directly east of the central business district. MidTown is a residential and commercial area; several historic districts have been designated. It is the location of the corporate headquarters of Aflac. North Columbus, also called "Northside," is a diverse suburban area, home to established neighborhoods and subdivisions, such as Green Island Hills and Oldtown. It has multiple shopping and lifestyle areas. South Columbus is situated just below the MidTown region, and directly north of Fort Benning. It is the site of the National Infantry Museum, honoring the history of infantry forces in the U.S. Army. the museum was located here in an effort to introduce jobs and attract visitors to stimulate a variety of activities. With little business development, this section has had poverty and associated crime. It has had bars, honky tonks, and other businesses that appeal to young male soldiers from Fort Benning. 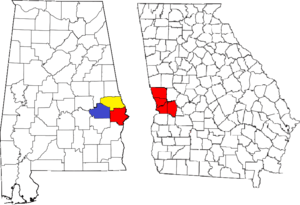 The Columbus Metropolitan Area includes four counties in Georgia, and one in Alabama. 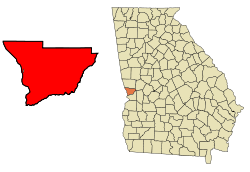 The Columbus-Auburn-Opelika, GA-AL Combined Statistical Area includes two additional counties in Alabama. A 2013 Census estimate showed 316,554 in the metro area, with 501,649 in the combined statistical area. As of the 2010 U.S. Census, Columbus had a total population of 189,885, up from 186,291 in the 2000 Census. The 2010 Census reported 189,885 people, 72,124 households, and 47,686 families residing in the city. 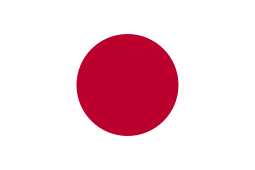 The population density was 861.4 people per square mile (332.6/km2). There were 82,690 housing units at an average density of 352.3 per square mile (136.0/km2). The racial makeup of the city was 46.3% White, 45.5% African American, 2.2% Asian, 0.2% Native American, 0.14% Pacific Islander, and 1.90% from other races. Hispanic or Latino of any race were 6.4% of the population. There were 69,819 households out of which 34.6% had children under the age of 18 living with them, 44.7% were married couples living together, 19.6% had a female householder with no husband present, and 31.7% were non-families. 26.7% of all households were made up of individuals and 9.4% had someone living alone who was 65 years of age or older. The average household size was 2.54 and the average family size was 3.08. In the city the population was spread out with 25.6% under the age of 18, 11.9% from 18 to 24, 29.8% from 25 to 44, 19.7% from 45 to 64, and 11.6% who were 65 years of age or older. The median age was 33 years. For every 100 females there were 94.7 males. For every 100 females age 18 and over, there were 91.6 males. The median income for a household in the city was $41,331, and the 2000 median income for a family was 41,244. Males had a median income of $30,238 versus $24,336 for females. The per capita income for the city was $22,514. About 12.8% of families and 15.7% of the population were below the poverty line, including 22.0% of those under age 18 and 12.1% of those age 65 or over. Columbus contains approximately 200 Christian churches, with the Southern Baptist Convention being the largest denomination by number of churches. Columbus is also home to three Kingdom Halls for Jehovah's Witnesses, and one Greek Orthodox Church. Other religions are represented by two synagogues, three mosques, and a Hindu temple, the latter two reflecting an increasing number of immigrants in the region from Southeast Asia. Companies headquartered in Columbus include Aflac, Carmike Cinemas, TSYS, Realtree, Synovus, and the W. C. Bradley Co. Founded in 1953, the Columbus Museum (accredited by the American Alliance of Museums) contains artifacts of regional history as well as works of American art. It mounts displays from its permanent collection as well as temporary exhibitions. Columbus is home to the National Civil War Naval Museum, a 40,000-square-foot (3,700 m2) facility that opened in 1962. It features two original American Civil War military vessels, uniforms, equipment and weapons used by the Union and Confederate navies. The Coca-Cola Space Science Center opened in 1996 for the purpose of public education in science, physics, and astronomy. It includes four flight simulators and a planetarium. The National Infantry Museum and Soldier Center opened in June 2009; it includes displays related to the history of the Infantry from the founding of the nation to the present. Its IMAX theatre is used to show related films and special productions. Columbus is served by one major indoor shopping mall, Peachtree Mall, which is anchored by major department stores Dillard's, Macy's, and J.C. Penney. The total retail floor area is 821,000 square feet (76,300 m2). Major strip malls include Columbus Park Crossing, which opened in 2003, and The Landings, which opened in 2005. Columbus is also served by The Shoppes at Bradley Park, a lifestyle center. MidTown contains two of the city's early suburban shopping centers (the Village on 13th and St. Elmo), both recently renovated and offering local shops, restaurants, and services. A. J. McClung Memorial Stadium, a football stadium. It was the site of the football games between the Georgia Bulldogs and the Auburn Tigers (the Deep South's Oldest Rivalry) from 1916 to 1958. It became the home of college football's Pioneer Bowl in December 2010, and hosts annual rivalry games between Tuskegee University and Morehouse College as well as between Albany State University and Fort Valley State University. The Bradley Theater, a performance theatre that opened in mid-1940 by Paramount Pictures. Columbus Civic Center, a 10,000-seat multi-purpose arena that opened in 1996 and is home to the Columbus Cottonmouths (SPHL) and the Columbus Lions (PIFL). It is also the primary arena used for concert events in Columbus. Golden Park, a 5,000 seat baseball stadium, is the former home to the Columbus Catfish. It was also the site of the softball events of the 1996 Summer Olympics that were held in the city of Columbus. 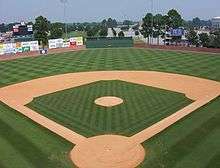 It opened in 1926, making it the oldest baseball park in the city. RiverCenter for the Performing Arts, a 2,000-seat modern performance theatre that first opened in 2002 and is operated by the Columbus not-for-profit organization RiverCenter Inc. The theatre is commonly frequently used for local events, and occasionally used for nationally recognized performances. Springer Opera House, a historic live performance theater located in Downtown that opened in early 1871. Former United States President Jimmy Carter proclaimed it the State Theatre of Georgia for the 1971-72 season. The legislature made the designation permanent in 1992. Columbus is home to upwards of fifty parks, four recreation centers, four senior centers and parks, and Standing Boy Creek State Park. The Columbus Fall Line Trace is a fitness trail that runs from Downtown to the northeastern section of the city. The Black Heritage Trail is a National Recreation Trail of historic and cultural significance. The Chattahoochee River white water opened in 2012. After the Eagle & Phenix Dam was breached, river flow was restored to natural conditions allowing the course to be created. 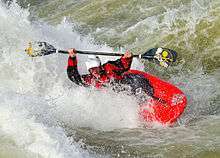 The 2.5-mile (4.0 km) course is the longest urban whitewater rafting and kayaking in the world, and has been ranked the world's best manmade whitewater course by USA Today. It also features the Blue Heron Adventure, a zip-line connecting users from the Georgia side of the river to the Alabama side. 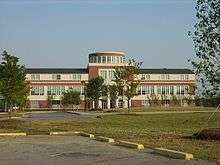 The Muscogee County School District holds pre-school to grade twelve, and consists of thirty-five elementary schools, twelve middle schools, and nine high schools. The district has 2,068 full-time teachers and over 32,944 students. The Columbus Metropolitan Airport (IATA: CSG, ICAO: KCSG, FAA LID: CSG) is the metro area's primary airport and the fourth busiest airport in Georgia. It is located just off of I-185 exit 8. It is served by ExpressJet Airlines' Delta Connection service, offering several daily flights to Atlanta. METRA Transit System is the primary provider of mass transportation in Muscogee County, currently operating nine routes in Columbus. The current public transportation services are operated as a function of the Columbus Consolidated Government under METRA. Greyhound Lines provides intercity bus service with the Columbus station located on Veterans Parkway, Downtown Columbus. Columbus Celebrates The Millennium: An International Quest (The American Enterprise Series) by Pamela Baker and Delane Chappell, 1999, Community Communications Inc. Enriching Lives: A History of Columbus State University, by Reagan L. Grimsley, 2008. Donning Publishing. ↑ "American FactFinder". United States Census Bureau. Retrieved 2015-02-03. ↑ "Population Estimates". United States Census Bureau. Retrieved 2015-09-23. ↑ Encyclopaedia Britannica. vol. VI. New York. 1911. p. 746. ↑ Mrs. John A. Logan, Reminiscences of a Soldier's Wife, p. 246. ↑ Base Realignment And Closure. Retrieved 2011-04-11. ↑ "NOWData - NOAA Online Weather Data". National Oceanic and Atmospheric Administration. Retrieved 2012-08-21. ↑ "About Uptown". www.uptowncolumbusga.com. Retrieved 2016-07-19. ↑ "U.S. Decennial Census". Census.gov. Archived from the original on May 11, 2015. Retrieved June 3, 2014. ↑ "Annual Estimates of the Resident Population: April 1, 2010 to July 1, 2013". Retrieved June 3, 2014. 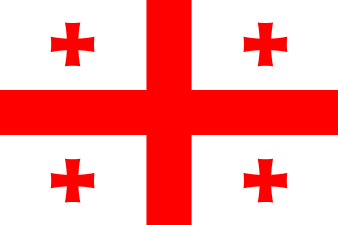 ↑ "Columbus (city), Georgia". State & County QuickFacts. U.S. Census Bureau. 1 2 3 "Georgia – Race and Hispanic Origin for Selected Cities and Other Places: Earliest Census to 1990". U.S. Census Bureau. ↑ Georgia Secretary of State - State Theatre, sos.state.ga.us; retrieved February 2007 (from Springer Opera House). ↑ Trail map. Retrieved 2010-07-29. ↑ "Built to thrill: 12 crazy man-made adventures". USA Today. Retrieved 4 November 2015. ↑ Columbus City Council Archived February 4, 2007, at the Wayback Machine.. Retrieved 2010-07-29. ↑ Office of the District Attorney for Chattahoochee Judicial Circuit. Retrieved 2010-07-29. ↑ Muscogee County Sheriff's Office. Retrieved 2010-07-29. ↑ Columbus Consolidated Government City Phone Directory. Retrieved 2010-07-29. ↑ Office of the Clerk of Superior, State and Juvenile Courts of Muscogee County. Retrieved 2010-07-29. ↑ List of schools in Columbus, Retrieved Sept. 2009. ↑ Georgia Board of Education, Retrieved June 24, 2010. ↑ School Stats, Retrieved June 24, 2010. Wikivoyage has a travel guide for Columbus. "Columbus, a city and the county-seat of Muscogee county, Georgia, U.S.A.". Encyclopædia Britannica (11th ed.). 1911. "Columbus. 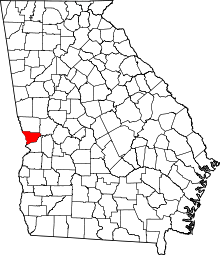 A city and county-seat of Muscogee County, Georgia". New International Encyclopedia. 1905.